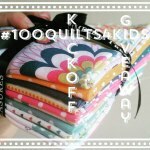 This year’s 100 Quilts for Kids annual charity drive is being run by Alyson this year, who blogs over at The Hasty Quilter. In checking it out the other day, it looks like there is still a ways to go! In 2015, the quilting community donated 119 quilts, yet this year, there are only about a dozen quilts linked-up so far. 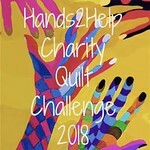 Knowing how generous the quilting community is, let’s try to exceed last year’s number! There is still time, as this year’s drive will run through the end of November. I encourage you to pull out those tops you have lying around that you can’t decide what to do with, add a fleece-back (see my Part 1, Part 2 and Part 3 tutorial here), and donate them to foster kids in your community through your local government’s Family Services department. I will be linking this to this year’s 100 Quilts for Kids annual charity drive, which Heather over at Quilts in the Queue used to oversee. This year, Heather turned the reins over to Alyson who blogs over at The Hasty Quilter. In checking it out the other day, it looks like we still have a ways to go! In 2015, the quilting community donated 119 quilts, yet this year, there are only about a dozen quilts linked-up so far. Knowing how generous the quilting community is, let’s try to exceed last year’s number! There is still time, as this year’s drive will run through the end of November. Mon-star is a friendship star quilt pattern. The inspiration for this quanket began with the monsters fabric, shown in the lower right corner – another new fabric that was too cute to resist. I chose the other fabric colors based on the colors in the monsters fabric, and while the colors are all rather saturated, I felt putting focus on the teal-blue star brought the contrast that was needed. This was donated to the County of Ventura, Children & Family Services, for a foster child in October 2016.